Students engaging in game of Humans vs. Zombies on the Doble Quad in 2011. If, for whatever reason, you have often found yourself digging through the policy section of your Lesley student handbooks, you might have noticed an interesting addition to the weapons section. Between the Spring and Fall of 2011, in addition to the expected prohibitions against guns, blades, ammunition, explosives and things of the sort, toy guns and other “simulated weapons” were also added to the list. The ban on faux weapons came following the termination of a game many of our current seniors might remember called Humans vs. Zombies. In many respects the game is a variation of tag, specifically infection tag. All players start out as humans with the exception of one zombie who’s objective it is to convert all other players eventually leaving one last man standing. However, Humans vs. Zombies has a slight twist. Humans can defend themselves from being tagged by a zombie by shooting the undead with their trusty Nerf gun, effectively rendering the zombie immobilized for 15 minutes. It is this element of the game which concerned members of the administration such as Dean Mays. According to Mays, he was completely unaware of the game’s existence until he noticed a student carrying what appeared to be a black gun of some sort. Mays asked the student why he had the toy gun, at which point he was informed of Humans vs. Zombies for the first time. Not long after, the game was shut down and the next academic year the student handbook got a slight addition to the weapons policy. Many students, especially those who enjoyed and participated in the game, viewed the decision to ban the game and prohibit nerf guns and other toy weapons as an overreaction. To them, Humans vs. Zombies was purely about fun and, given that they were using toys that are designed to avoid injury, there didn’t seem to be much reason for such drastic action. But despite the confusion some might have, Dean Mays asserts that there were in fact a number of problems with the game which made it unacceptable. The game was organized through the club Local Acts of Fun or LAF and approved by USG. But Dean Mays argues that USG does not have the authority to condone the use of weapons on campus and therefore the game should have never happened in the first place. Above all, Mays has made clear his concerns regarding the mental and emotional impacts that the game could have on individuals who have had traumatic experiences with gun violence in the past. “I would be concerned about those people who are in the residence halls who come from experiences in life where gun violence is real.” Mays explains, “And to be in your residence hall and to hear somebody say ‘shoot him, shoot him’, even if it’s a game, it triggers something in that person”. 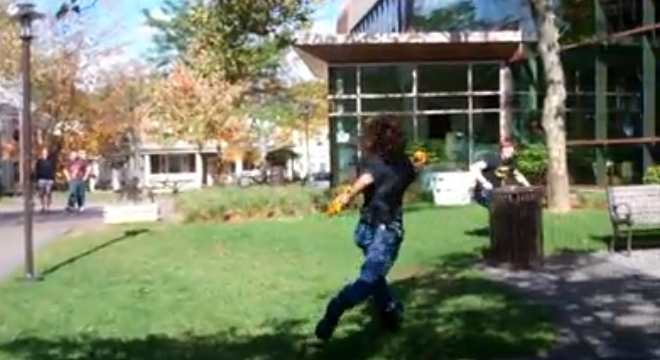 While it may have been short lived at Lesley, for many of those who participated, Humans vs. Zombies remains a fond memory of the unique, quirky, and fun kind of activities that contributed to their college experience.